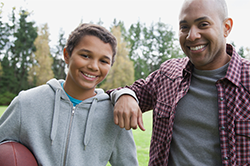 In honor of National Mentoring Month, Mercy Home for Boys & Girls is reaching out to any caring and qualified adult who wants to make a difference in the life of a child. The 132-year old childcare organization headquartered in Chicago’s West Loop operates one of the area’s oldest and most successful mentoring programs for underserved young people. Known as Friends First, the program matches adult volunteers with children, ages 9-17, who need positive role models. Mercy Home provides training and ongoing support to ensure the quality and impact of the mentoring experience for all. Participants enjoy multiple opportunities every month to share in one-on-one activities throughout Chicagoland, such as ballgames, museum trips, or even nearby parks, or in guided activities held on site at Mercy Home’s West Loop Campus. Many of the children who participate have seldom ventured outside of their own neighborhoods. But the adult mentors who volunteer through Mercy Home’s Friends First program help these children expand their horizons and experience new parts of the city. Most of all, every one of our mentors serves as a supportive friend who can lend an ear and lead by example. The only qualifications to become a Friends First mentor are that they be 21 or older, committed to making a difference, and a good listener. Mercy Home screens and trains volunteers and provides ongoing support, supervision, and encouragement to matched adult-child participants. Our match support staff helps to foster significant and life-changing friendships. Friends First staff offer support above and beyond what is provided in typical mentoring programs. This includes providing access to one of Mercy Home’s licensed clinical social workers, 24 hours a day, 7 days a week. Our staff is on a first-name basis with every mentor and child. Mercy Home also provides support and referral services to families of the young people who participate to help address any underlying challenges that impact their lives. Through this integrated family approach, the program and our volunteers are helping to create a stronger and more resilient community. In addition to the community-based and site-based options within its volunteer mentoring program, Mercy Home works with businesses whose employees mentor young girls from a Chicago elementary school. Currently, AT&T and TransUnion participate in the program, bringing young people into their Chicago corporate offices to focus on leadership, empowerment, goals, and positive peer relationships. Mercy Home for Boys & Girls (www.mercyhome.org) has been a solution for kids in crisis since 1887. Through its residential, aftercare, and mentoring programs, Mercy Home offers a safe home, emotional healing, education, and life-changing opportunities for more than 900 young people and family members every year. It gives children who have suffered abuse, neglect, poverty and even abandonment the therapeutic, academic and vocational support they need to heal from the traumas of their pasts and build success for their futures. Mercy Home is 100% privately funded and operates at three locations in Chicago – a home for boys in the West Loop, a home for girls in Beverly-Morgan Park, and a staffed, supportive, and affordable apartment in South Shore for former youth residents who are transitioning to independent adult living.